Flying Colours Driving School. Contact: 07870 662825. Richmond Isleworth Twickenham St Margarets Kew Brentford Hounslow Whitton Hampton Osterley Ham East Sheen Mortlake Barnes Chiswick Hanworth Feltham. Flying Colours Driving School has now been established for over a decade, having earned its reputation as one of the most highly regarded driving schools in the area, providing driving lessons in Isleworth, Richmond, Twickenham and the surrounding areas. Flying Colours Driving School focuses on a fun approach to help you fulfil your driving potential with inspiring, professional driving tuition. In being one of the smaller, more locally situated driving schools, Flying Colours Driving School prides itself on offering a friendlier, more personal service than some of the larger driving schools. We also pride ourselves on the fact that all of our driving instructors are extremely personable, understanding and patient and are trained to ease the worst of nerves and the most anxious of pupils – we want you to look forward to your driving lessons, not worry about them. All of our driving instructors hold green ADI badges and are experienced, fully qualified driving instructors, unlike some of the larger national driving schools that offer driving lessons with trainee driving instructors who hold a pink PDI badge and are only partially qualified driving instructors. If this comes as news to you, it is worth investigating! Having been based in Richmond for a number of years, the Driving Schools main office is now based in Isleworth with the driving schools instructors operating predominately in the Isleworth, Richmond and Twickenham areas, however our driving instructors also offer their professional driving lessons beyond Isleworth, Richmond and Twickenham in the surrounding areas of Kew Gardens TW9, Ham TW10, Petersham TW10, St.Margarets TW1, East Sheen SW14, Mortlake SW14, Barnes SW13, Chiswick W4, Brentford TW8, Osterley TW7, Ealing W5, Hounslow TW3 TW4, Feltham TW13, Teddington TW11, Hanworth TW13, Hampton TW12 and Whitton TW2. Richmond, Isleworth, Twickenham and the surrounding Isleworth driving test area offer a perfectly rounded set of conditions for driving lessons. Whether it is practicing hill starts on Richmond Hill, getting to grips with the one-way system in Richmond or navigating Richmond Circus roundabout? Whether it is learning the manoeuvres in the quiet back roads of Isleworth, Twickenham or Richmond, practicing lane discipline around the traffic-light-controlled roundabouts running down the A316 passed Twickenham or learning the driving test routes for the Isleworth driving test centre? 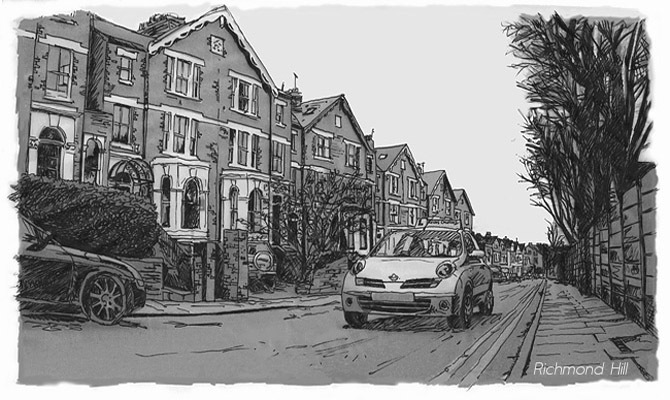 Our driving Instructors know all the roads around Richmond, Twickenham, Isleworth and the surrounding area like the back of their hand and can therefore prepare you for the driving test in Isleworth by helping you to familiarise yourself with the routes on your driving lessons. Since it began, Flying Colours Driving School has helped countless pupils through their driving test at the Isleworth test centre and many other nearby test centres such as Ashford (Middlesex), Tollworth, Weybridge, Greenford, Southall to mention but a few. Our driving instructors won’t let you down with appointments for driving lessons. Our driving instructors won’t give you more driving lessons than necessary. Our driving instructors won’t insist on two hour driving lessons. Our driving instructors will not ‘piggy-back’ (pick up the next pupil during your driving lessons). All our driving instructors are extremely friendly and personable. Our driving instructors have an excellent first time pass rate for the driving test. There is no extra charge for weekend driving lessons, evening driving lessons or pass plus driving lessons with Flying Colours driving school. You will always receive a full one hour driving lesson or two hour driving lesson with Flying Colours driving schools. Our driving instructors are always more than happy to pick you up from wherever it is most convenient for your driving lessons, whether it be from home, work or college. You will be taken through the driving test syllabus by highly qualified, professional yet extremely personable driving instructors in a patient and relaxed environment. Flying Colours driving school offers competitive rates for cheap driving lessons. Flying Colours driving school also offers staggered block booking discounts for cheap driving lessons. Flying Colours driving school offers Pass Plus driving lessons in Richmond, Isleworth, Twickenham and the surrounding area. Flying Colours driving school offers refresher driving lessons in Richmond, Isleworth, Twickenham and the surrounding area. Flying Colours driving school offers intensive driving lesson courses in Richmond, Isleworth, Twickenham and the surrounding area. Areas covered: Richmond TW9 TW10, Isleworth TW7, Ham TW10, Petersham TW10, Osterley TW7, Twickenham TW1 TW2, St.Margarets TW1, Teddington TW11, Whitton TW2, Kew TW9, Mortlake SW14, East Sheen SW14, Barnes SW13, Chiswick W4, Brentford TW8, Ealing W5, Hounslow TW3 TW4, Feltham TW13, Hampton TW12.